This post is part of my series on the work of the philosopher Carl Craver. 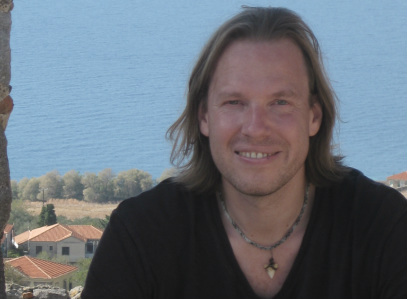 The series deals with the nature of neuroscientific explanation. For an index, see here. I am currently looking at an article by Craver entitled "Interlevel Experiments and Multilevel Mechanisms in the Neuroscience of Memory". In Part One, I covered Craver's non-formal account of mechanistic theories and applied it to the LTP mechanism (involved in memory consolidation). In Part Two, I discussed the multilevel nature of mechanisms, once again referring to the LTP example. In this part, I outline Craver's taxonomy of interlevel experiments and his arguments in favour of theoretic integration (as opposed to reduction). As detailed in part two, mechanisms are multilevel, i.e. one mechanism can be broken down into several sub-mechanisms and so on. This property can be exploited in designing experiments that fuel the goal of theoretic integration. First, we need to grasp the basic tools needed for testing mechanisms. Recall, that mechanisms are organised collections of entities and activities that carry out some task or perform some function. To work out whether your proposed mechanism is the correct one you need to (i) identify a model system that you think has this mechanism (e.g. a strain of mouse); (ii) use an intervention technique (e.g. electrical stimulation); and (iii) use some detection technique (e.g. whole cell recording). These elements are present in the basic experimental paradigm for mechanisms illustrated below. 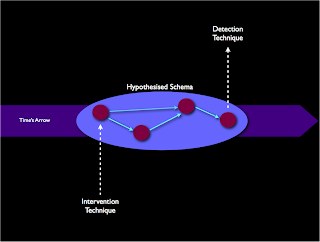 The image shows a hypothetical mechanism, an intervention technique and a detection technique. The intervention technique is temporally upstream from the detection technique. Note: this only shows one mechanistic level. 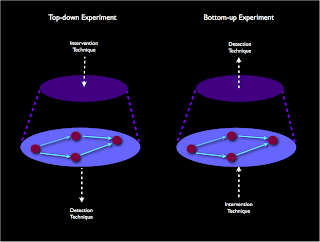 If we imagine a two-level mechanism, where the higher level mechanism is simply the role of the lower level mechanism, we can describe two basic types of interlevel experiments. First, there is the bottom-up experiment, where you intervene in the lower-level mechanism and detect the effects this has on the role. Second, there is the top-down experiment, where you intervene in the role and see what effect this has on the lower-level components. These are illustrated below. To these basic categories, Craver appends three additional experimental strategies. Activation Strategies: these are top-down experiments where you activate some role and detect its effects on its putative components. LTP research began when experimenters recorded from neurons in rat-hippocampi, while the rats were forced to navigate a maze. Interference Strategies: these are bottom-up experiments where you diminish, retard, eliminate or disable some mechanism component and record its effects on some higher level role. In this history of LTP research, various interference methods have been used such as ablation and special breeding ("knockout" mice). Additive Strategies: these are bottom-up experiments where you try to stimulate, augment, hasten or multiply some component of the mechanism. This is often done in mouse genetics, where researchers breed mice that over-express a particular gene. A central aspect of contemporary neuroscience is its integrative pretensions (this is one of Craver's core arguments - defended in other papers that I will be looking at). In other words, neuroscience does not seek to reduce behavioural theories to biochemical theories; rather, it tries to integrate these theories into a coherent overall picture. As he describes it, integration has two elements to it: (i) "looking up", i.e. showing how a component is involved in a mechanism; and (ii) "looking down", i.e. showing how an entity can be explained in mechanistic terms. The interlevel experiments and strategies show how each level of the mechanism is ontologically robust. They do so because independent lines of investigation all converge on the same mechanism. Turning to LTP, one of the ways in which neuroscientist's decide whether or not they are dealing with a real mechanism is by integrating molecular mechanisms with cellular mechanisms, cellular mechanisms with neural mechanisms, and neural mechanisms with behavioural mechanisms.